The 10-Q: The official quarterly report that must be filed with the Securities and Exchange Commission (SEC), the main regulator for stocks. It gives an update for the just-completed three-month period. The report is due 40 days after the end of the quarter for companies that have market values of $700 million or more. The 10-K: The official version of a company’s annual report required by the SEC. After the end of a company’s fiscal year, the company must provide an annual report called a 10-K. The 10-K, for most companies, is due 75 days after the end of the fiscal year. The income statement measures the company’s bottom line. It tells you how much the company earned during the quarter or year based on Generally Accepted Accounting Principles, or GAAP. The balance sheet: The statement shows what a company owns and owes at the end of the period. The cash flow statement tells you how much cash came into and went out of the company during the period and is considered to be one of the most important documents provided by companies. The cash flow statement is typically not included in a company’s earnings press release, but it’s worth waiting for in the 10-Q and 10-K. A company’s cash flow is more difficult to manipulate using accounting tricks because it’s based on the amount of cold hard cash that comes into the company. The SEC has a helpful article on financial statements. The SEC also provides a users’ manual online to show you how to download regulatory filings. When you download a regulatory filing, you might be shocked by seas of text and no pictures; they aren’t the colorful magazine-like document you recall when you think of an annual report. If you’ve read the 10-K, you probably don’t need the annual report to shareholders. But, the annual report to shareholders might provide additional, mostly promotional information about the company, such as photos of new products or happy customers, and they can be fun to look at depending on what the company does. You can order these paper documents from the investor relations section of most companies’ Web sites, if the company still produces print copies. Many companies, in an effort to save money, are only printing 10-Ks and making annual reports to shareholders available only online, if at all. You can obtain the electronic copies of annual reports to shareholders at most companies’ Web sites. Many of these annual reports are also available from services like AnnualReports.com, IRIN Annual Report Resource Center, and The Public Register’s Annual Report Service. Keep in mind, though, that annual reports from these services are often provided in Adobe’s Acrobat format. The Acrobat format preserves the photos of the annual reports but is harder to download into a spreadsheet to analyze. The SEC’s Interactive Data initiative represents one of the newest and best ways to download financial statements. The SEC is urging companies to make their financial results available using the increasingly popular eXtensible Business Reporting Language, or XBRL. While companies don’t have to issue their reports in XBRL, for the hundreds that do, you can easily download their data into a spreadsheet. 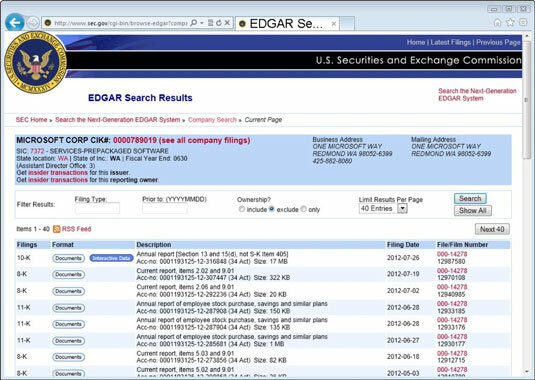 You’ll know that a company offers its financial reports in XBRL if you see a red button in the SEC site’s Edgar search results that says Interactive Data.